Oh these are so cute! Good job. Already follow your blog... Just out Mingling on Monday, getting an ealy start! Enter Weekly Drawing for a Free Candle! Oh, the mittens are adorable. I am your newest follower from the blog hop. Please follow me as well. Thank you. 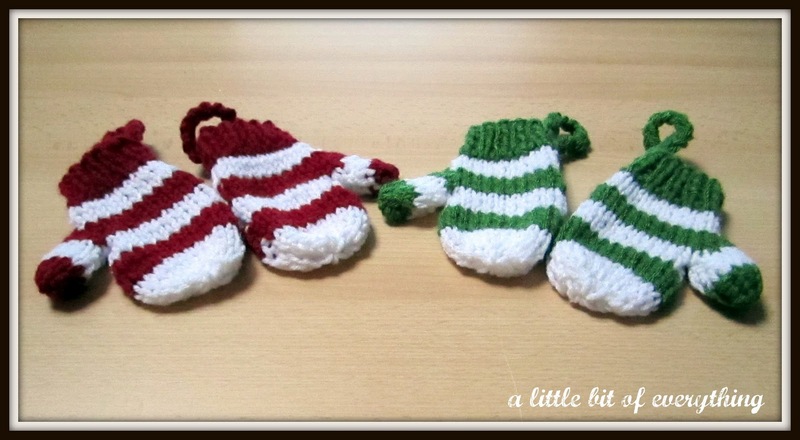 I love the stripes and the bright Christmasy colors! Thanks for linking up to Making Your Home Sing Monday! I just love these! They'd be perfect for an advent calendar, too. Great blog! I'm your newest follower and can't wait to come back to read more! Would love it if you stopped by my blog to follow along as well. Blessings! I am blog hopping and thought I would stop by your blog. Please stop by either or both of my blogs and follow. These are so adorable! I am tryingto teach myself to knit. Maybe I will be able to knit some like this next year! Come link up to my Sew Crafty Party! Very cute! Thanks for linking to A Round Tuit! I'm your newest follower, Please follow me back here@ Step It Up! Yeay it's tueasday and I'm following you on GFC. So cute. Thanks for the link. I found you through the Follow Us Monday Morning blog-hop at Being Frugal and Making It Work. Just stopping by to say hello and to follow you. You do yummy cookies and adorable knit ornies....I'm jealous. And Then There Were 4.. Following your blog from BassGiraffes! Please follow back! love blogs that have a little bit of everything. Just followed. Hope you will stop by. Oh, that's a craft I really want to learn. Those are so cute! I would love to learn to make things like that for my little granddaughter. And please be sure to come by and enter my fantastic year-end giveaway. Click the picture in my sidebar for details. Love your mittens...I am following you via Fun Follow Friday..please follow back. very cute! I just learned to knit this year, I need to get a pattern, these are so cute. Thanks for linking up to Topsy Turvy Tuesday's!